From the Scooby Doo collection by ICUP. Scooby-Doo Shaggy and Scooby Be the Character Apron. This Item is in stock and ready to ship. You should not postpone your purchase and miss out on adding Scooby-Doo Shaggy and Scooby Be the Character Apron to your Scooby Doo collection! From the Scooby Doo collection by ICUP. 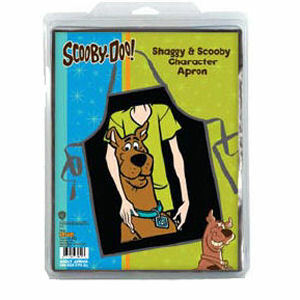 Scooby-Doo Shaggy and Scooby Be the Character Apron. One size fits most adults. Size: 27in W x 31in H (68.5 cm x 79 cm), 24in (61 cm) neck loop, 33 in (84 cm) waist tie. ICUP Scooby Doo Attire shipping from Canada. No Surprise Border fees or Customs!